On the evening of Friday 16th of May, Westholme’s A2 Physics students were treated to a tour of Chorley hospital’s medical imaging facilities. Medical Imaging techniques and their underlying physics feature on one the A2 modules so this was an invaluable opportunity for the students to see the devices they had been learning about being used practically. Their guide for the evening was Dr Stockwell, who ably explained some complex physics to the students whilst at the same time testing their understanding throughout the visit. 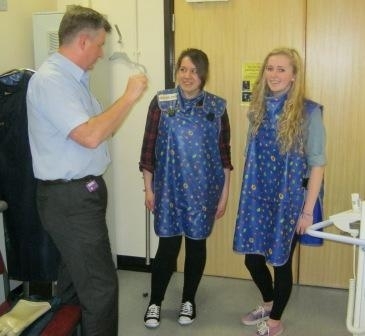 The students were shown modern X-ray machines in use and were able to wear the lead filled protective equipment that radiographers must wear on a daily basis. They were also given detailed explanations of CT, ultrasound, and PET scan images. The students and the Physics department would like to thank Dr Stockwell and his team for giving up their time. Everyone agreed that it was a fascinating trip which would no doubt help them in their exam preparation.